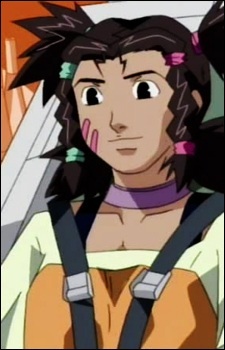 Pilot of the Gustav, Moonbay is probably the most free spirited person throughout the Zoids series. She is very kind and she always speaks her mind. She is also a good cook. Moonbay is one of the funniest characters and is always looking for a way to make money. We first meet Moonbay when she crosses paths with Van and Fiona in the desert whilst transporting items in the Gustav. She is a good zoid mechanic and helps Van repair the Shield Liger then joins them on their travels. It is later revealed she is a smuggler and is transporting weapons to the Guylos Empire. She doesn't work for the empire, she just does what pays the most. Moonbay is very independent and acts as such, but when times are tough, she helps out any way she can. She takes on the role of repairing Irvine and Van's zoids throughout the series. She also has a thing for Irvine, but she refuses to admit it. It is also stated early on that both her and Irvine have known each other for a while.